When running the x3d exporter with Triangulate enabled some of the vertices in the mesh get saved multiple times resulting in duplicate vertices and edges. The result is a "cut" in the surface that can be opened up by moving one of the duplicate vertices or edges. 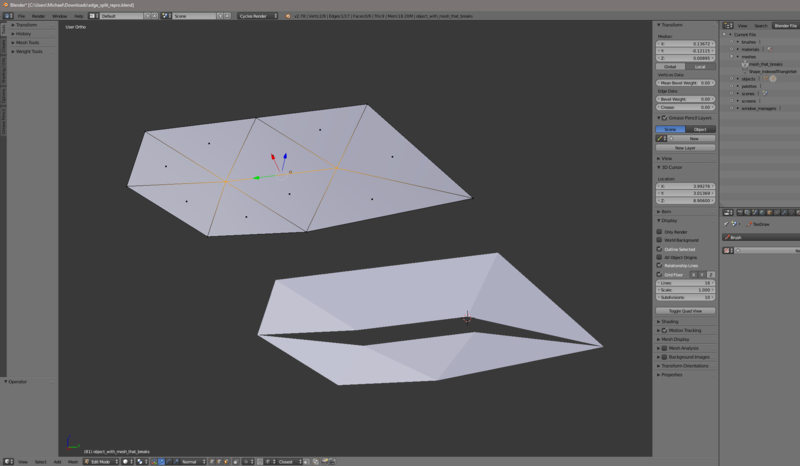 The attached screenshot shows the original mesh (to the left, with one of the edges that get duplicated selected) and the mesh after exporting and then reimporting the mesh with Triangulate enabled (to the right) with the "cut" opened to show which edges are being duplicated. Reimport the .x3d file into blender or open it in any other software that supports .x3d files. Which means I'm really just rounding it down to 7 decimal points, at which point the precision error seems to go away on the meshes I have gotten the problem in. This might not be the root cause (as it might be a bug that the UV coordinates differ) which is why I am submitting this as a bug rather than a patch. I am also not sure if there is a reason why the UV coordinates are stored as the key instead of the vertex index (v_idx), it is possible that using that index instead of relying on the UV coordinates might be a better solution. The workaround I described turned out to not work for cases where a split is actually intended, since any vertices that are at the same coordinates will end up being merged. My new approach, which so far seems to work, was to still round the coordinates down to the 7th decimal but to also add the vertex id to the key when matching on uv. And I then just made sure to pass in v_idx to vertex_key when looping through the faces right below in the code. sorry to bother. Any updates on this? any feedback would be greatly appreciated so that we can move forward with other exporter contributions for the blender community. Sorry to bother again. Any news on this? We submitted it over a year ago. Bastien Montagne (mont29) added a commit: rBA4ecd2f7a5f13: Fix T49420: X3D Exporter generates duplicate edges and splits the mesh when….